International collaboration makes up an increasing, high citation-impact share of research output, but the UK’s collaboration with key partners is threatened by its decision to leave the EU. Data show that about 85% of US and UK international collaboration is with only one or two partners, usually among other “leading” research economies. Although highly multinational research (10 or more authors) is growing more rapidly than total research output, it actually remains scarce (about 1% of all collaboration) among the established research economies. Analysis also shows that the “citation bonus” contributed by international collaboration is in fact both specific and limited; it should, therefore, be interpreted with some care. For example, citation impact trends look different for two-country and multi-country collaborations involving the same countries. Impact also increases but then plateaus with increasing numbers of partners. Further, we find that massively multinational papers are of such a different kind that we suggest they should be excluded from standard citation analysis. The detailed, comprehensive bibliographic records of the Web of Science™ and predecessor databases established by Garfield (1955), et seq. enable us to track not simply publications but through them the evolving structure and sociology of the global research enterprise. One pervasive and far-reaching topic for analysis has been that of collaboration between disciplines, between institutions, and between countries and the benefits that arise in fertilizing ideas, increasing impact, and enabling development. Garfield was interested in the disciplinary structure of science, and the Web of Science grew over a period when the balance of activity between nations was relatively stable. National profiles and interactions are now as dynamic as disciplinary interactions and, in this arena, Garfield’s creation and scientometric analysis meet and powerfully address real policy and national economic strategy. The bibliographic record shows that while co-authorship in research publications was rare before the 1980s, it has since then been steadily increasing (e.g., for the UK: Frame and Carpenter, 1979; Strengthening University Earth Sciences, 1987; Adams, 2012). There is evidence that individual papers have more authors and that authors on each paper are located across more countries. 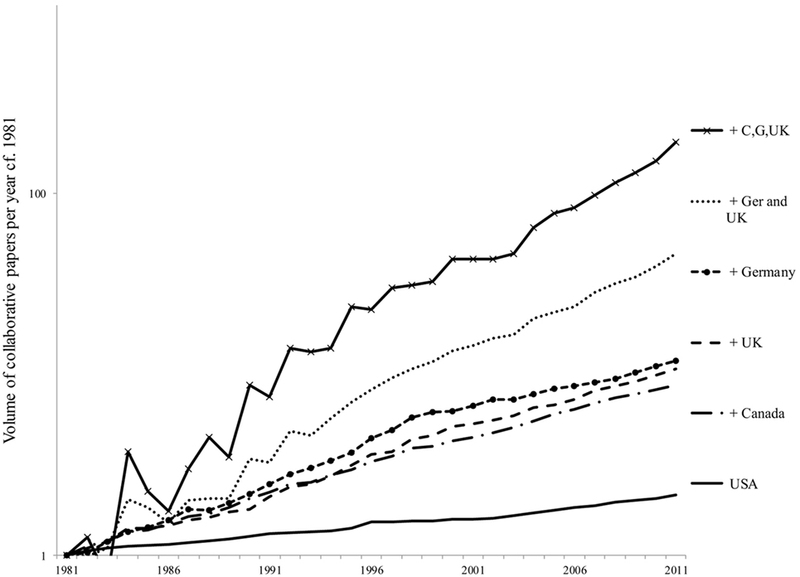 It is argued that connectedness must be intensifying because authorship has increased exponentially while the number of collaborative papers increased only linearly (Persson et al., 2004; Greene, 2007). In this regard, ISI’s bimonthly publication Science Watch (e.g., King, 2012) has described the growing frequency of massively multi-authored papers: those with more than 1,000 author names. It has been suggested that this trend is associated with the inception of major global research facilities and trans-national cooperative programmes (Georghiou, 1998). In Europe, changing collaboration patterns are indeed likely to be a consequence of the cohesion factors in the European Commission’s Framework Programmes, which encourage multi-national partnerships irrespective of scientific merit. In 2016, the UK’s vote to leave the EU raised significant questions about its future European research collaboration. UK policy is consequently focused on the merits of existing and new partnerships and their likely contribution to its research profile. Wagner and Leydesdorff (2005) and Leydesdorff et al. (2013) have argued that international collaboration in science can be analyzed as a network. Adams et al. (2007a) pointed particularly to the intense levels of interactions between leading research economies in such networks. In consonance with this, Leydesdorff and Wagner (2008) suggested that the global network reinforced a core group of (14) cooperative countries with strong national systems. They argued that peripheral countries could be disadvantaged by increased strength (of interaction and outcome) at the core and Adams (2013) agreed, noting that the “peripheral cost” as networks among the research elite become dominant would marginalize those individual institutions that were not properly engaged. Disadvantage arises from lack of access to the most intense knowledge environments and the high-quality work that they spawn. For example, there is a “citation impact bonus” benefit from collaboration (Katz and Hicks, 1997), which appears to be greater for international collaboration (Van Raan, 1998; Glanzel and Schubert, 2001; Persson et al., 2004; Schmoch and Schubert, 2008). This was first quantified by Moed (2005) (Table 23.1) but has also been qualified in some analyses (He, 2009). It is unclear whether the benefit reflected in citation indices comes from motivation, i.e., collaboration arises because the research opportunity is compelling, or emerges from the network, i.e., collaboration exposes the research to a bigger audience. Either way, those not involved suffer a deficit. This paper analyses data for the UK (supported by comparisons with the US) to test how much collaboration is in practice with many or with only one or two partners, and (following Moed, op. cit.) what relative benefit is gained from bilateral and multilateral collaboration. We find that although highly multinational research has increased relatively rapidly, as reported, it remains relatively scarce. Furthermore, it appears that the “citation bonus” that international collaboration contributes may be specific and limited. It needs to be interpreted with care, because the “gain” in citation impact looks different when analyzed for two-country and multi-country collaborations involving the same countries. Although international collaboration seems indeed to be associated with higher impact than the national average (contra: He, 2009), the bonus of expanding networks does not continue to increase beyond a modest number of partners. Finally, we suggest that massively multinational papers are of such a different kind that they are probably best excluded from standard methodologies for citation analysis. Co-authorship is taken implicitly as a proxy for collaboration, while noting Katz and Martin’s (1997) caveat that it is only a partial indicator thereof. Data were sourced from Thomson Reuters Web of Science™ at summary level for the period from 1981 to 2011 and in detail for publications for the period from 1 January 2002 to 31 December 2011. The Web of Science data are dominated by publications with authors from the USA, China, and Western Europe including the UK, Germany, and France, which are the major research economies in the European Union. Analysis focused on these countries, and then in more detail on the UK and, to a lesser extent but to provide a comparator, the US. All publications were extracted for each of the five countries where at least one author had at least one address for that country. The totals were then restricted to publications with the document type of articles or reviews (i.e., substantive research papers that attract citations). In this text, these documents are referred to as “papers”. The papers were collated as national sets without an author address from any other country (i.e., purely domestic) and with a foreign co-author (i.e., international). For the combinations of countries in our analysis, the total number of co-authored papers (e.g., papers with at least one UK address and papers with at least one Germany address) were counted and, then, within each of these sets, the purely bilateral papers (e.g., papers with no address other than for the UK and for Germany) were separately identified. This process, therefore, identified, for each of the five frequently publishing countries: total papers by year; count of papers with each of the other four countries; the count of bilateral papers with just one of those countries as a co-author; and the count of domestic papers with no international co-author. The numbers of their papers with combinations of two, three, or four country addresses was identified. A visual analysis of the relative numbers of these purely bilateral, trilateral, and quadrilateral papers is restricted to the four most prolific countries: a visual analysis the fifth country (France) is simply too problematic to draw in two dimensions. The four most prolific (US, China, UK, and Germany) collectively published 5.4 million papers among 10.7 million papers globally indexed on Thomson Reuters Web of Science during 2002–2011 (i.e., around half the recent global total). The relative citation impact of domestic and collaborative papers is also of interest. The citation impact of each UK paper and its collaborative authorship could be readily analyzed, but at the time of analysis, the US data set was too large for ready processing at this level of detail. For this analysis, the citation count for each paper was normalized to take into account the year of publication and the subject area of the journal (Adams et al., 2007b; Waltmann et al., 2011). Average normalized citation impact was evaluated by year for the UK’s frequent co-author countries (US, China, Germany, and France). Separate sets were collated for those papers where the specific partner was the sole co-author and where the specific partner was one of several co-authoring countries. The average citation impact of each of these sets of papers was calculated. An average was then calculated across the entire UK dataset for the UK domestic papers, for the set of internationally collaborative papers overall, and for each count of the number of co-authoring countries (in this case, irrespective of which country was a co-author). A caveat on interpretation is required regarding the effect of geography. Collaboration between Los Angeles and Cambridge, MA, USA involves a greater geographical distance (around 3,000 miles) than between Istanbul and Cambridge, England (less than 2,000 miles). For the period 2002–2011, a total of 3,167,914 papers (i.e., articles and reviews) were extracted from the Web of Science with one or more author addresses located in the US. Of these, 2,278,812 had only US author addresses (i.e., 71.9% of all US papers were purely domestic in origin). For the same period, 847,360 papers were extracted with one or more UK author addresses. Of these, 382,398 (45.1%) had one or more co-authors with a non-UK address. The UK is apparently more internationally collaborative than the US, but these data do not inform us about any cultural predisposition to collaborate. For both the US and the UK, the number and proportion of papers with an international co-author has increased over the last decade, as expected from other reports. In 2010, for the first time, the UK was a co-author on more papers with international partners than it published purely domestically while the US international share rose from one-quarter to one-third over the decade (Table 1). As a consequence, since each has become inextricably intertwined with other research economies, it will be increasingly difficult for any comparative analysis of a country’s research performance to identify a separate national component. Table 1. The number of papers (articles and reviews) for the US and for the UK with at least one domestic author and the number and proportion of those papers with one or more international addresses, from journals indexed on Thomson Reuters Web of Science. The summary matrix of total and bilateral collaboration between the five countries (Table 2) confirms that the USA is the most frequent international partner for other countries, including the UK, with which it co-authored 116,192 papers between 2002 and 2011. It also partners frequently with Germany and France, noted earlier as the other principal research economies in Europe. Beyond the G7, the US is partnering increasingly often with China with which its 2011 annual total of papers was five times higher than in 2002. In 2010, for the first time, the US published more papers with a China co-author than with a UK co-author. A relatively high proportion of those papers were bilateral, involving only US and China authors, not multilateral (Table 2). Table 2. The number of papers co-authored by the US and the UK with four major international partners during 2002–2011. Across Table 2, around half of the international collaboration is bilateral but the make-up of the individual links varies. For the US–China pairing, three-quarters of the joint papers (69,454 of 89,999 papers where both countries co-authored) were purely bilateral. By contrast, although UK collaboration with the US has increased since 1981 (in common with the generic global pattern), it has done so more slowly than within its region, with France and Germany. As a consequence, UK collaboration is now relatively more frequent with European partners than was true historically. This growing EU collaboration is also relatively more trilateral than were the US links: only around one-third of France–Germany–UK papers are bilateral, which suggests some stimulus toward more comprehensive networking. The trends are illustrated in Figure 1 (US) and Figure 2 (UK). Purely bilateral authorship as a proportion of total joint authorship each year over the longer period since 1981. That trend is remarkably consistent for the established research economies, down from 0.6 to 0.8 bilateral in 1981 to 0.2–0.4 bilateral now. China then appears as a disruptive factor for any combined analysis of “international collaboration” since it is both expanding and less multilateral. The data split into three groups: the EU triangle; US–Europe links; and then these nations’ collaboration with China. The rapidly growing US–China axis is the most clearly and consistently bilateral: it might be argued that only the US has a large enough research capacity to absorb the potential for partnership that is offered by the rapid expansion of China. Other economies are both smaller and already more collaborative with existing partners. Figure 1. Increase in the relative frequency (log scale) of papers for the USA with co-authors from frequent partner countries [Canada (C), UK, Germany (Ger, G)]. Data shown with most frequent collaborators both singly and in collaboration; other countries may also co-author on any or all of these papers. The data show that the increase in collaboration with multiple partners is more rapid than the increase in output as a whole. Figure 2. Increase in the relative frequency (log scale) of papers for the UK with co-authors from frequent partner countries [USA, Germany (Ger, G), France (Fra, F)]. Data shown with most frequent collaborators both singly and in collaboration; other countries may also co-author on any or all of these papers. The data show that the increase in collaboration with multiple partners is more rapid than the increase in output as a whole. 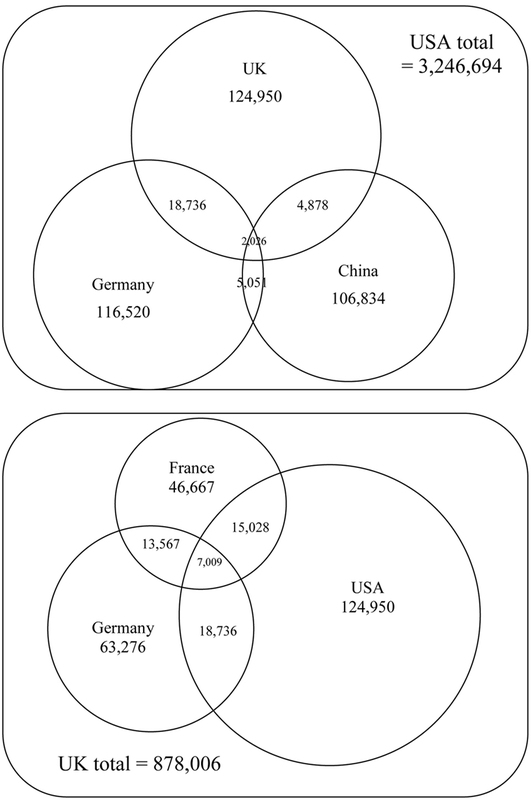 In Figure 3, the deconstructed 2002–2011 data for trilateral and quadrilateral collaborative papers are shown for the US and UK and their links with one another and with China and Germany. Whereas Figures 1 and 2 emphasize a trend of declining bilateral co-authorship, Figure 3 provides a balancing illustration that reflects the diverse underlying spread of trilateral papers and the rarity of papers with four or more countries present among co-author addresses. Figure 3. International collaboration intersections for the USA and UK, illustrating the relative frequency of bilateral, trilateral, and quadrilateral co-authorship. The figure in the outside box is the total national output for 2002–2011 and the figures in each circle and sector are the numbers of papers for the relevant intersection. For example, the USA published over three million papers of which 124,950 had a UK co-author. Of those, 4,878 also had China as a third author, and of those 2,026 had a fourth German co-author. For the US, no more than 4% of its papers over the decade are co-authored with any one country (Canada, not analyzed here, is the fourth most frequent co-author). Slightly less than 0.5% are co-authored jointly with Germany and the UK (and in fact with either of these and France, not shown). For quadrilateral papers, just 1,593 (0.05%) have Chinese, UK and German co-authors; if France were shown, then US joint papers with the three EU leaders would be 0.2% of total US output. The UK is, as noted earlier, widely thought to have become more collaborative within Europe because of the common funding and management environment provided by the EU Framework Programmes (Georghiou, 1998). Almost 14% of its papers have a US co-author and 7% have a German co-author. Less than 2% have co-authors from both those countries while trilateral papers with either of these and China make up less than 0.5%. The 1,593 quadrilateral papers with these, the largest research economies, are 0.2% of UK output. The significance of these analyses is the comparative scarcity of papers involving more than two nations and the marked rarity of those involving any four nations. The most substantial triangle relative to domestic output is that between the West European nations—12,095 papers in total—and this benefits their quadrilateral total with any other partner. In fact, many of these 12,095 papers also have co-authors from major European research economies such as the Netherlands and Sweden. They are poly-European outputs, but still number only around 1,000 per year. The next part of the analysis deconstructs the relative citation impact of bilateral and multilateral papers and concentrates on UK partnerships as a tractable dataset. The UK’s Department of Business, Innovation, and Skills reported that the UK benefits from enhanced citation impact in its international collaborations (BIS, 2012). Data in Figure 4 endorse that report but reveal that such analysis refers to papers with many other co-authors. A more specific analysis emerges when bilateral papers, with just a single international partner, are examined separately. First, the numbers of relevant papers fall but they do not fall proportionately across the different partners. As shown in Figure 3, less than one-third of UK papers with Germany and France have them as the sole co-author. By contrast, almost one-half of UK–USA papers have these two countries as sole partners as do well over 60% of UK–China papers. Figure 4. 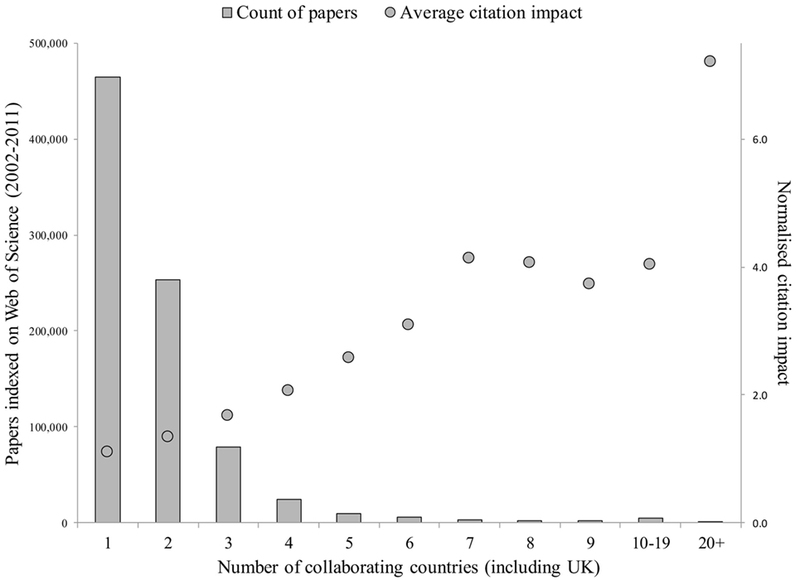 Normalized citation impact of UK papers co-authored with one or more partner countries for papers on which a named partner is also a collaborator; other countries may also collaborate; France appears to contribute the greatest benefit. Figure 5 (citation impact for UK bilateral papers) contrasts with Figure 4. First, it is now apparent that papers with the US have a clear citation advantage over France and Germany. Second, between the two EU partners, it is Germany that brings a slight advantage. Third, average relative citation impact is rising for bilateral papers with EU partners. Fourth, UK–China papers remain at or around world average citation impact (1.0). Overall, if there is any citation gain from year to year with single partners (which might be inferred for France and Germany), then it is functionally small whatever its statistical status. Figure 5. Normalized citation impact of UK papers co-authored with a partner country where the named partner is the only collaborator; the USA contributes the greatest benefit but the trend is flat whereas the benefit from EU partners is rising. Why is citation impact rising overall for UK international collaborations among these countries but not for the most frequent two-country partnerships? A possible answer emerges from the wider dataset. Taking all UK papers and counting the unique country partners: 55% of UK papers have only UK authors; 30% have a single international partner; less than 10% have two partners; and just 6% (which is 50,575 papers) have three or more partners in addition to the UK itself. 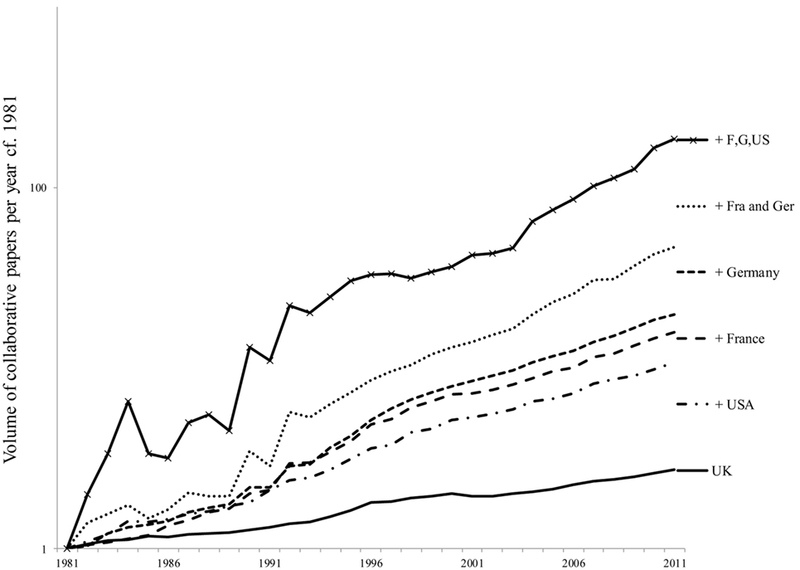 Just 0.7% of UK papers in the decade have the USA, France, and Germany as joint authors, though the number of such quadri-national papers is increasing relatively rapidly (reflected in the steeper slope for these lines in Figure 2). It is among the relatively small number of papers with many partners that a pattern emerges that may explain both the effect of multinational co-authorship and its limitations. It becomes evident that for each additional partner country up to six (a total of seven collaborating partners including the UK), there is a gain in average normalized citation impact, until the average reaches 4.0. Papers with 8–20 co-authoring countries show no further gain (Figure 6). Figure 6. UK papers (articles and reviews) indexed on Web of Science, 2002–2011, and analyzed according to the number of unique countries (including the UK) for author addresses and the average citation impact of the set of papers for each count of countries. Impact increases to a group of seven and then levels out. Highly multinational papers (>20 countries) are analyzed in Figure 7. It is worth remarking that the UK citation impact values graphed in Figure 6 are similar to those computed for a global dataset by Moed (2005), Table 23.1. Moed showed that bilateral papers were cited 1.24 times more often than domestic, multilateral were cited 1.64 times more often, and highly multinational (10 or more countries) were cited 3.23 times more often. Moed also noted a degree of discipline variation. The relationship between co-authorship and impact breaks down entirely at the upper end of the distribution. There are 387 UK papers, which have 20 or more co-author countries (less than 0.05% of total UK papers). Almost half have 35 or more co-author countries and two have more than 50 co-author countries. There is, so far as we can detect, no general relationship between collaboration and average citation impact for these papers, and this is in contrast to the correlation seen for increasing authorship with fewer than 10 co-author countries (Figure 7). Figure 7. UK papers (articles and reviews) indexed on Web of Science, 2002–2011, where there are 20 or more unique countries (including the UK) among the author addresses. Average normalized citation impact is shown for data grouped by author number. Bubble size is scaled to count for each set (scale marker = 10 papers). There is no correlation between impact and number of countries. These highly multi-authored papers are concentrated in a few disciplinary areas with half in “physics” journals, particularly astronomy and particle physics. Others refer to genome-related research and to epidemiology and health studies (Table 3). Some but not all of these highly multinational papers show very high citation impact and their disciplinary provenance suggests that they refer to global grand challenges of widespread significance and social impact. Table 3. UK papers with 20 or more collaborating countries, grouped by discipline area. However, the specialized nature (particle physics), exceptional content (grand challenges), and author abundance of these papers are problematic when they are included in datasets with more mainstream publications. 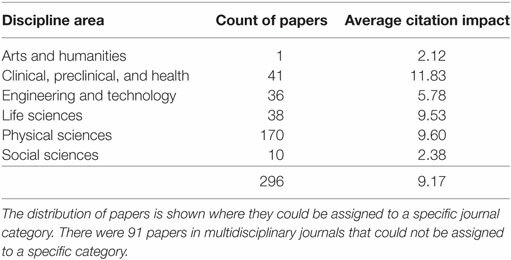 What is problematic for analytical purposes is that, although some of this small set of highly collaborative papers have a citation impact similar to that of papers with 8–20 collaborating countries, the set also includes papers with normalized citation impact that is over 100 times world average. The inclusion of such papers in any meta-analysis—which must occur when many countries are compared at a gross level because of the diverse authorship—would distort the average citation impact values for any research group, many institutions, and some countries. The depth and comprehensive nature of the databases founded by Eugene Garfield enable us to document dynamic changes in the global research base and the self-organized reification of a scientific community beyond national boundaries (Price, 1963; Merton, 1973; Zitt and Bassecoulard, 2004). The analyses in this paper add nuances to our interpretation of internationally collaborative research, particularly regarding the ways in which international partners do or do not add increasing citation impact to collaborative work, and the limits to such additionality. This is of central importance to UK research policy at a time when its departure from the European Union threatens the existing collaborative networks built through the Framework Programmes across Europe. For the UK, 95% of papers in the last 10 years were either domestic or had one or two partner countries. There is a trend toward increasing multi-party international collaboration. 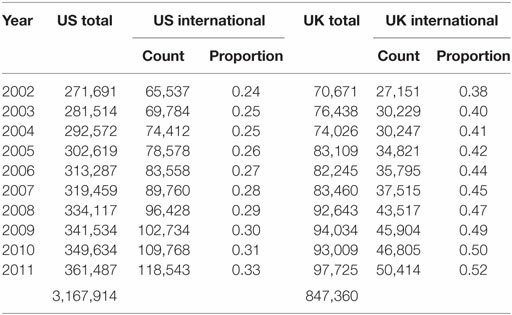 The number of UK-international co-authorships exceeded half of UK output in 2010 (Table 1). 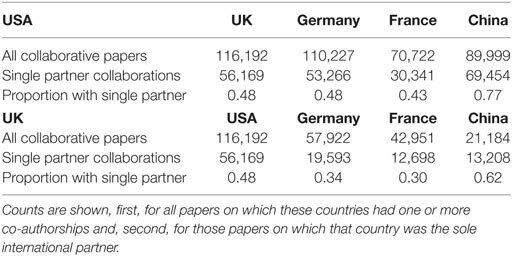 The abundance of UK papers co-authored simultaneously with the USA, Germany, and France is increasing more rapidly than for any other part of the UK publication portfolio but multinational papers remain relatively scarce and only 2% of UK papers had five or more partners (Figure 3). The UK gains in citation impact when it collaborates with major partners (Figure 4). It is, therefore, a surprise to find that a reported trend of rising average citation impact is not associated with bilateral, single country partnerships (Figure 5). Indeed, the citation impact gain from bilateral papers is much less than was expected from the literature referenced in the Section “Introduction.” Why should do partners not add any citation impact to bilateral papers where their combination on multilateral papers evidently does? Perhaps the reported citation benefits are derived not from “ordinary” collaboration but from the multinational component, as a network effect. When we analyze multilateral partnerships, we find that the average normalized citation impact of UK papers rises with the number of additional countries that co-author, as we should predict from the global data in Moed (2005), reaching an average of 4.0 times world average when there are six partners in addition to the UK (7 in total). However, that benefit does not continue to increase. There is no further gain in average citation impact for papers with 8–20 collaborating partners (Figure 6). One possible explanation is that there is an effective citation “saturation” where the potential citation gain from adding a further partner (when they cite the paper) is already accounted for in their collaboration with an existing partner (i.e., their citation is anticipated in that third-party collaboration). We recommend that for analytical purposes, any paper with more than 20 collaborating countries (Figure 7) should be assigned to a separate category. Georghiou (1998) suggested that the trend to massively multi-authored papers—those with more than 1,000 author names—was associated with the inception of major global research facilities and trans-national cooperative programmes. These papers could, as a consequence, have anomalously high citation counts. We confirmed that those UK papers that have 20 or more collaborating countries have, as a single group, a higher average citation impact. For this subset, however, there is no statistical relationship between impact and authorship: the pattern is chaotic (Figure 7). 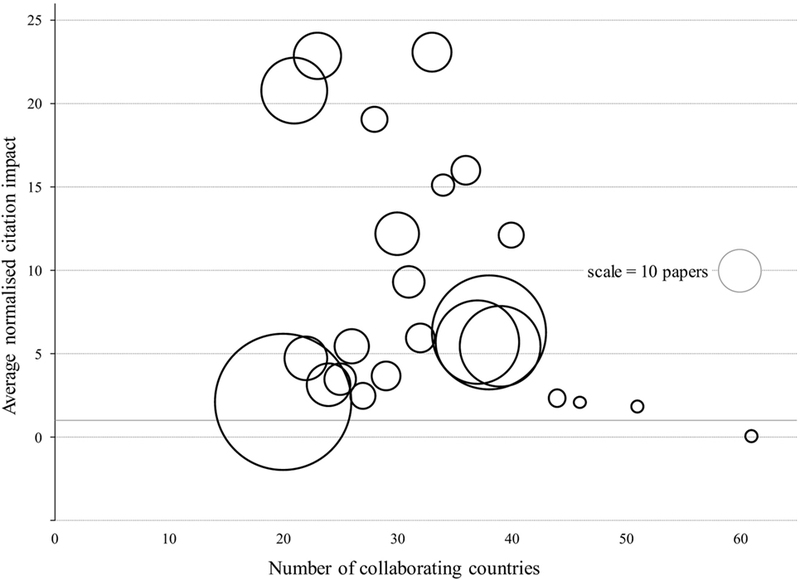 Some papers with 20–30 partner countries have citation impact in excess of 20 while some with 40 collaborating countries have impact around 5. These papers are few in number, quite concentrated in disciplinary diversity, and have an exceptional but erratic citation impact. Since they are the scarce outliers in any dataset, it is difficult to analyze the group as an entity, but where they are part of a sample, then, they may have a strongly skewing effect on any indicators based on average citation counts or average citation impact. The two authors contributed equally to the concept, analysis, and development of this article. We thank: Loet Leydesdorff (Amsterdam) and Caroline Wagner (Ohio State) for discussions around the challenges of analyzing international collaboration; Nigel Thrift (Warwick) for asking about comparative rates of change in multinational partnerships, and Henk Moed and Caroline Wagner for their helpful comments as referees. A preliminary version of this paper was originally submitted to the 2015 Atlanta conference on Science and Innovation Policy. Adams, J., Gurney, K. A., and Marshall, S. (2007a). Patterns of International Collaboration for the UK and Leading Partners. A Report Commissioned by the UK Office of Science and Innovation. London: Department of Innovation, Universities and Skills, 27. Available at: http://image.guardian.co.uk/sys-files/Education/documents/2007/07/13/OSICollaborationSummaryRepo.pdf (accessed 16 March 2018). King, C. (2012). Multiauthor Papers: Onward and Upward. Science Watch (Thomson Reuters). Available at: http://archive.sciencewatch.com/newsletter/2012/201207/multiauthor_papers/ (accessed 16 March 2018). Price, D. S. (1963). Little Science, Big Science. New York: Columbia University Press. Strengthening University Earth Sciences. (1987). Report of the Earth Sciences Review. London: University Grants Committee. Zitt, M., and Bassecoulard, E. (2004). “Internationalisation in science in the prism of bibliometric indicators,” in Handbook of Quantitative Science and Technology Research, eds H. F. Moed (Amsterdam: Kluwer), 407–436. Copyright: © 2018 Adams and Gurney. This is an open-access article distributed under the terms of the Creative Commons Attribution License (CC BY). The use, distribution or reproduction in other forums is permitted, provided the original author(s) and the copyright owner are credited and that the original publication in this journal is cited, in accordance with accepted academic practice. No use, distribution or reproduction is permitted which does not comply with these terms.